I hit up the Allegan Antique Market this weekend with my mom and sister in-law and we found some awesome goodies. So many that we had to make multiple trips back and forth to the car, which is always the sign of a successful day of shopping! Two of my favorite finds ended up in our dining area. 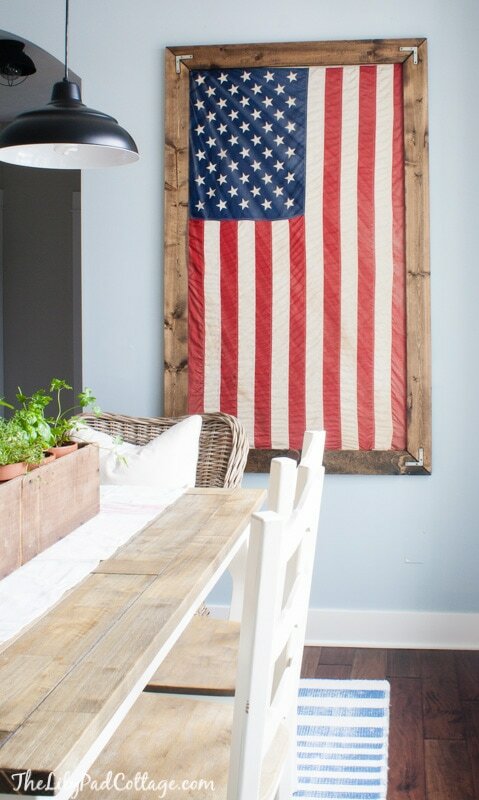 I loved this vintage flag, and when I saw it, I immediately envisioned it hanging up in our dining space. I got it home and hung it up from the grommets and I loved the way it looked, but it seemed a little incomplete. I quick built this rustic wooden frame from scrap wood I had in my garage. It’s totally simple to make, just four 1×4’s cut to size and a couple of brackets. I hung the frame right over top of the flag that was already on the wall. It framed it out so nicely, not to mention it keeps little hands from pulling on the flag. Hanging the flag in here sparked a great discussion with my kids about the 4th of July and how blessed we are to enjoy the freedoms we have living in the United States. It looks perfect with my red buffet table too! My table got a little swap out also with this long wooden box I found. I always keep pots of fresh herbs around, but they are usually in my kitchen which doesn’t get much light. I’m constantly setting them over on the dining table in the afternoon to catch more sun, so I thought I would make it their new permanent home. I took the kids to the nursery to grab a few more herbs plus some terra-cotta pots to plant them in. The 6 inch pots fit perfectly in the trough and it will be so easy to lift them out to water them all. So, now I have a super cute planter filled with delicious herbs that I’m not allowed to use, for fear of injuring “Susan or Henry”. I hope you all have a safe and wonderful 4th of July! 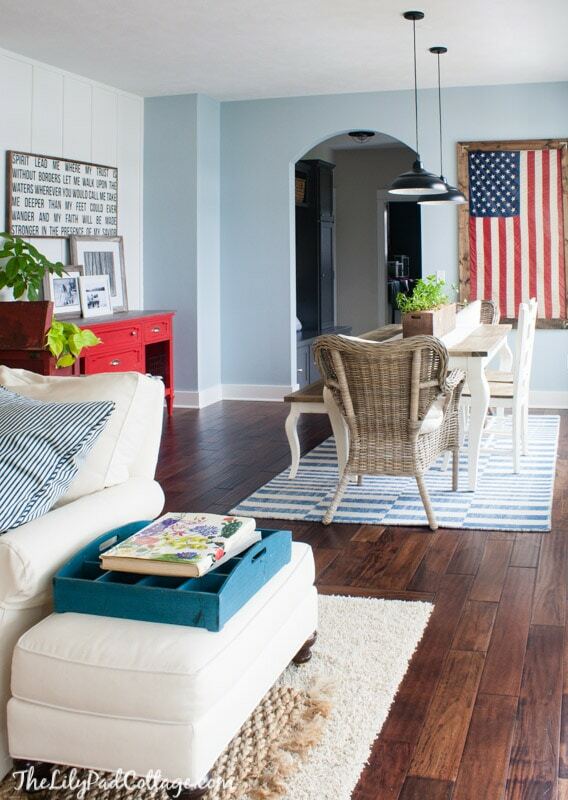 Love the vintage flag framed! Thanks Beth, I love it when an idea comes together like it looks in my head! Very clever and I love the way the brackets show — very rustic. If you DON’T prune the herbs they will get leggy and die :-( That would be worse than giving them a slight haircut. Then they will grow heartier!! I know, we parents and grandparents have to be on our toes and one step ahead. You can do it!!!! As always, you did it again. Wonderful! As far as the boxcar children, one of my favorites as a child. Mine too! It has been so fun to read them to my kids. The flag looks fantastic!!!!! I think framing it out was a great idea. The perfect touch. Happy 4th of July! Thank Heidi, happy 4th to you as well! You have done it again, outstanding! I just love the flag and your frame. Perfect location for it. 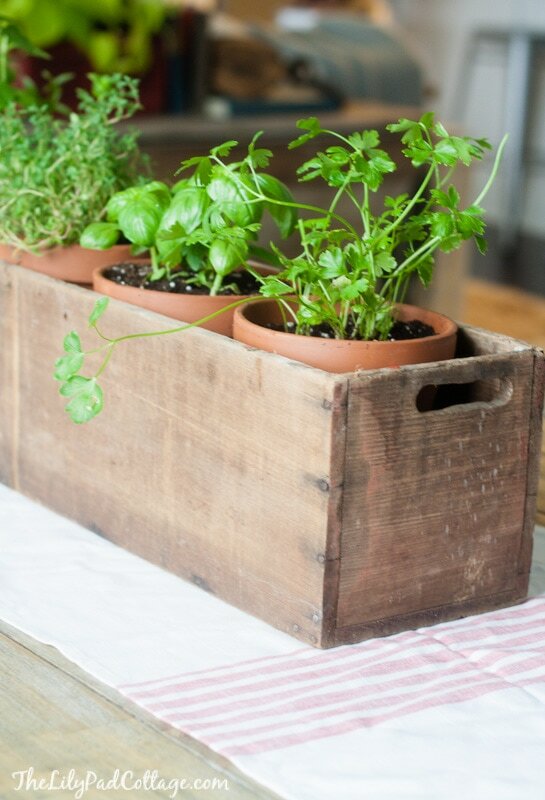 Great idea for your herbs. Can’t wait to plan a trip to the antique market. I always look forward to your posts. Enjoy your fourth! Hi Doreen, yes you should definitely plan a trip to an antique market, it’s so fun! 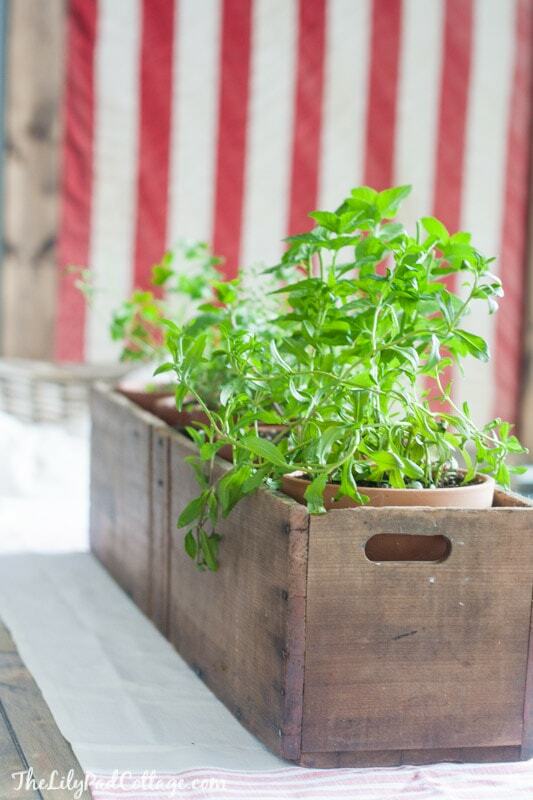 Fresh herbs are the best ~ and your kiddos… pretty cute! Hi Carol! I actually researched this extensively bc I wanted to make sure I got it right :) the union is always supposed to be displayed on the left whether vertical or horizontal. It seems odd bc you are right if I rotated the flag it would be wrong, but thats what the flag code says thanks! OH! So sorry. My bad. :-/ Thanks for setting me straight. Beautiful!! 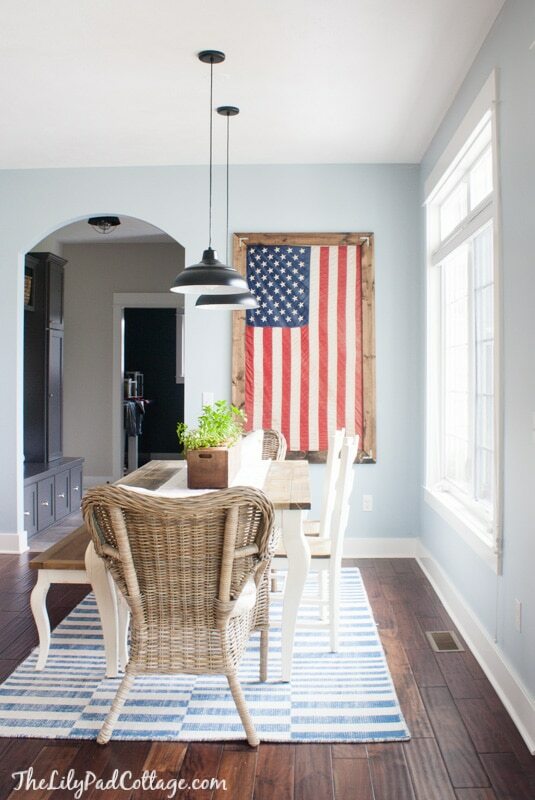 That flag is such a find, and looks great in your frame! Happy 4th! Hi Lissy, thanks so much! I really like how you framed your flag. I have box just like yours that my husband built me. 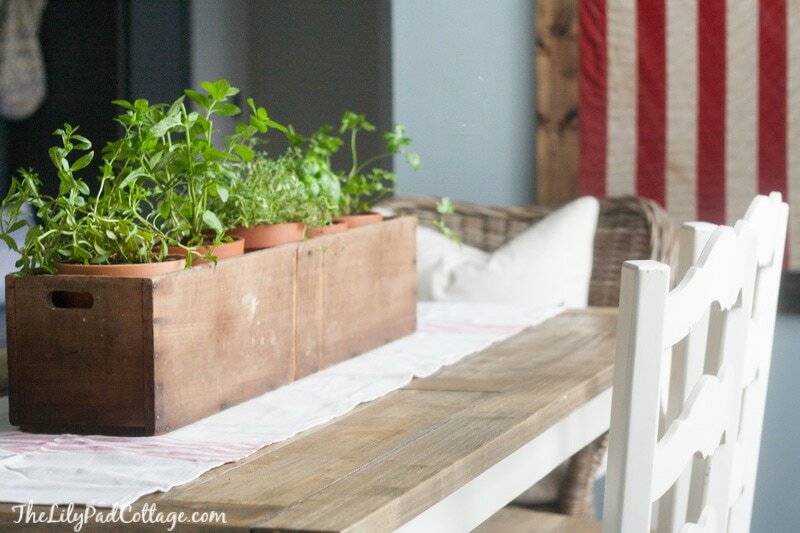 And this is an awesome way to decorate with it–fresh herbs! Are your wicker chairs from Ikea? Hi Peter, I get it, but in this case that was the rustic vibe I was going for :) Thanks! Lovely finds, but please, we celebrate Independence Day on July 4th. Hi Mara, I’m not really sure what you mean by this comment except that I titled the post 4th of July decor? If that’s what you meant it’s because that was the best fit for good SEO (search engine optimization) just one of the many little behind the scenes things bloggers have to think about. So although it might not be proper, it was a better option for me :) Happy Independence Day! Lovely looking decor…again! I know that 4th July is a big event in the US (I live in the UK). is it just a one day celebration? 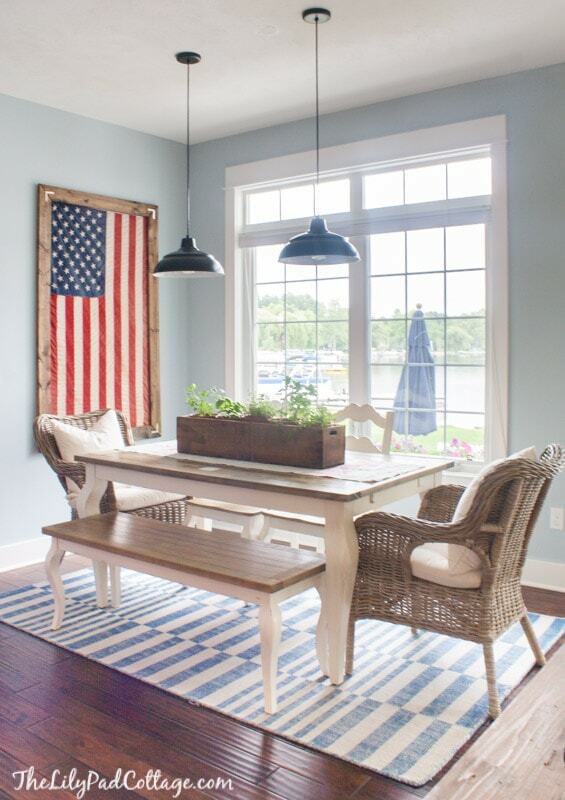 I like the idea of the flag as a decoration – looks great. Would you keep it on the wall for a while or just until after the weekend? I think I’m just noticing the beautiful rug under the table! Can you please share its source? Thanks! I’m new to Lilypad Cottage and I love your style! I also know you’re in MI on a lake, but trying to figure out where? I’m in Kalamazoo and if you went to Allegan, you can’t be TOO far! Keep up the great ideas !! Kelly, I love what you did with the flag and the trough. Your kids are too cute!! You have a beautiful home and I love following your blog! The framed flag is just perfect! I could steal the long narrow box…..Question, we are rehabbing. What kind of floor do you have? Is it wood, did you install it yourself? Would you choose it again? What kind of wood floor do you have in your dining room? Is it hardwood or engineered wood? I’ve been searching your blog all afternoon for your dining room table. Did you paint this yourself? If so, what are the colors you used? Thanks so much!! Hi Stephanie it’s from World Market unfortunately they don’t carry it anymore – sorry! Hi. 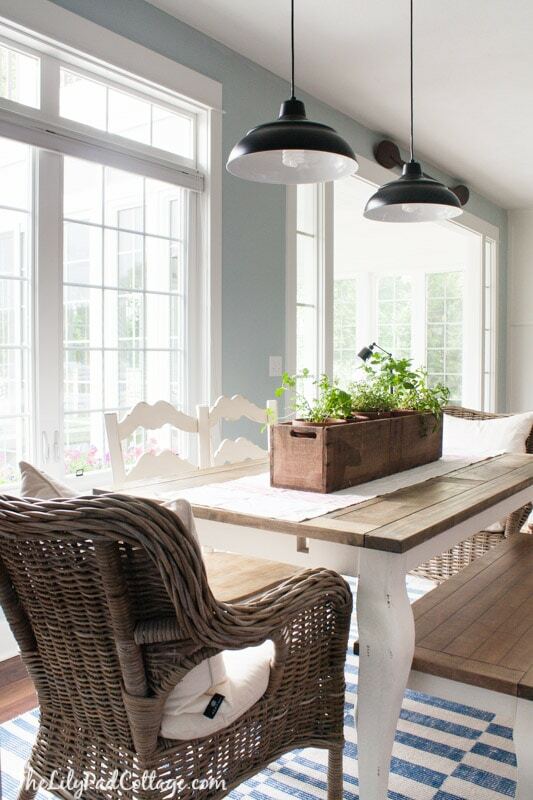 What is the brand and color of paint in your dining area? Beautiful! Where did you find your wicker chairs from? What size is the vintage flag? Such a great idea! It’s probably around 3 x 6 maybe? Thank you for getting back to me! :) Looks amazing! Can I ask what type of wood and stain did you use? It was just scrap lumber from the garage and leftover stain too – sorry!